Two articles published last week in Nature Medicine (https://www.nature.com/articles/s41591-018-0049-z and https://www.nature.com/articles/s41591-018-0050-6) have recently been brought to the center of the gene-editing discussions. Not surprising, these articles discuss the interactions between CRISPR and TP53, a well-known tumor suppressor protein-coding gene. The headlines have again been polarized to argue that CRISPR either causes cancer or that CRISPR has nothing to do with cancer. These two papers report that the activities of CRISPR and p53 are antagonistic. While CRISPR promotes breaks in DNA, p53 triggers its repair, and both DNA break and repair have a lot to do with cancer development. The evidence is that gene-edited human cells are most likely to cope with CRISPR genetic modifications if they are deficient in p53 or, in other words, prone to cancer. While CRISPR might not be directly responsible for causing cancer, it increases the risk of developing cancer cells these articles show. One of the papers (Ihry et al. 2018) shows that every time p53 is shut down in the human cell, CRISPR achieves high efficiency in gene-editing (about 80%). 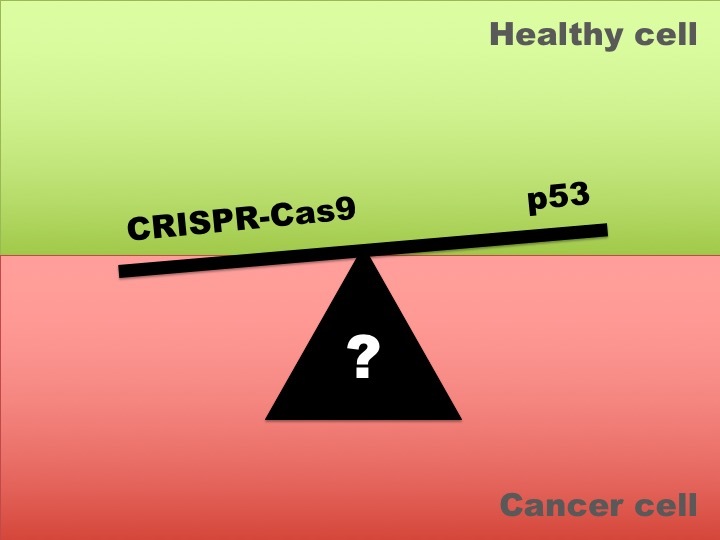 It has been proven that a higher efficiency of CRISPR is associated with a lower activity of p53 and vice-versa. However, this high efficiency of CRISPR comes at a high cost too. It is toxic and kills most cells. While several studies have demonstrated that multiple DNA cuts by CRISPR is responsible for cell death, this study shows that a single gene cut may be sufficient to kill most human pluripotent stem cells. This is because some cell types are more sensitive to DNA breaks than others. These authors then alert to the fact that “p53 inhibition could alleviate [Cas9] toxicity but has the potential to increase off-target mutations and poses a risk for cancer”. The second paper (Haapaniemi et al. 2018) tells the same story but they go a bit further. CRISPR-treated surviving cells were analyzed for their p53 activity. In a very elegant cell-based assay, these authors observed a selective growth advantage of gene-edited cells with a defective p53. In other words, the surviving gene-edited cells are the ones with non-functional or less-functional p53, which will then be more “vulnerable to the introduction of chromosomal rearrangements and other tumorigenic mutations”. What we know as ‘cancer’ in humans is a complex group of diseases with many possible causes. The implication of these articles are that gene-edited cells can be further developed into cancerous cells, because they were either selected by having a deficient p53 activity or because they have undergone many DNA breaks without proper repair. Thus, this type of research enlightens new potential risk pathways that are not directly linked to CRISPR mode-of-action. The fact that CRISPR can have a negative impact to cells primary metabolism is relevant to all living organisms on earth and not limited to CRISPR applications in human gene-therapy. Many gene-editing studies using other species were limited to the investigation of CRISPR efficiency, and because these two papers have now shown the relationship between high efficiency and carcinogenicity, it also opens up a possibility for a similar case in other organisms that were simply not yet tested for. It is once more important to recognize that the successful future of such biotechnological applications must be accompanied with biosafety research as well as on good regulations to ensure its safe use.